Abosheshey (At the End of it All) is a 2011 Indian film in Bengali starring Rupa Ganguly, Raima Sen and Ankur Khanna in lead roles. 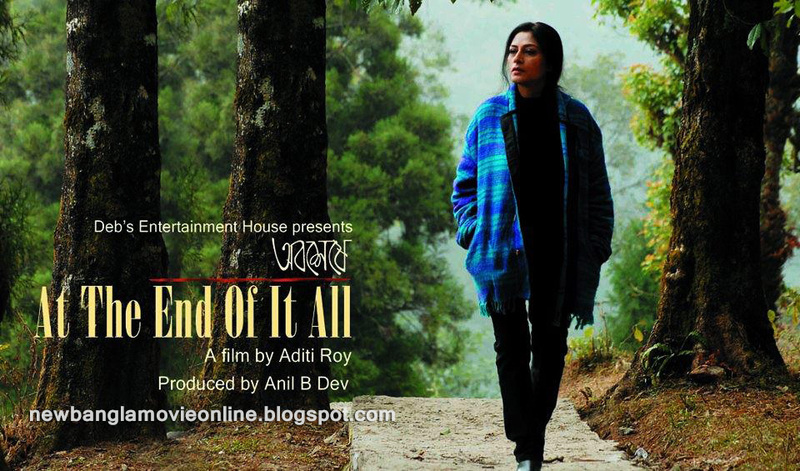 The film is the directorial debut of Aditi Roy. The film was screened at various international film festivals and received many accolades. The story is about a son who is trying to learn about his dead mother. Dipankar De as Suchismita’s elder brother. The film is director Aditi Roy's first feature film. After graduating from Jadavpur University in Political science, Roy did post-graduate specialisation in Film Studies in 2002. She also completed a Diploma in Mass Communication. Her Diploma film was screened at the Kolkata Film Festival in 2007. Roy previously directed a few short films with the writer Neel B Mitra. The story of Abosheshey was written in 1999 by Mitra. After working together on various projects, they decided to make this script their first feature film project. The film went through 17 drafts between 2008 and 2010. The production of the film started in November 2010. Two times National Film Award winner Ranjan Palit was opted as the director of photography. Rupa Ganguly rejected the lead role when approached for the first time, but she then accepted it after reading the script and understanding that the film would be shelved if she rejected it. The film was shot in real locations in Kolkata and Sikkim. The scene in the Advocate's house and office was shot in the residence of a real family of lawyers. Suchismita's apartment is also actress Rupa Ganguly's own house.